Where Earth Meets Water revolves around several characters and I have to admit that at first I found it somewhat difficult to get into the story as I had to work a bit at keeping things straight. I am not sure if I personally have trouble when the story moves around a bit or if it just takes time to get used to that style of writing, but once I did I thoroughly enjoyed the story of Karom, Gita, Lloyd and Kamini. 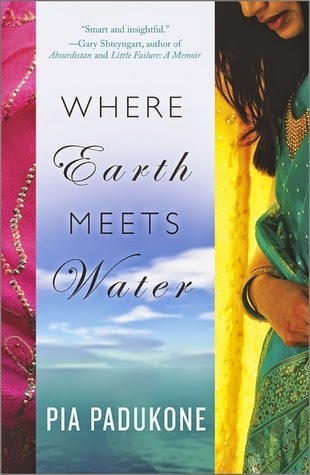 Where Earth Meets Water centers a lot on tragedy and the repercussions on being involved or having loved ones be involved in such awful and heartbreaking events. I found this a unique story simply because not many authors are willing, or even able, to broach such a sensitive topic. The story had enough momentum to keep me interested even when some events seemed to be too overdone with not enough happening. There were also some places that ideas seemed to be left hanging and never resolved by the end of the book. Despite this the novel was quite intriguing and some plot points took time to come together so I definitely wanted to keep reading to figure everything out. For a debut novel, I would definitely recommend it especially if you like a bit of mystery in a fictional dramatic storyline.